This is the grand daddy of theme parks (opened in 1843) and is unlike all others. Its attractive lake-and garden setting is meticulously manicured. Tivoli Gardens features amusement park rides as well as classical, popular, and rock concerts. Restaurants and other eateries abound. At night, 100,000 lanterns and other lights create a magical ambiance. And the evening firework show dazzles. See Copenhagen's picturesque buildings from a sailor's eye view. 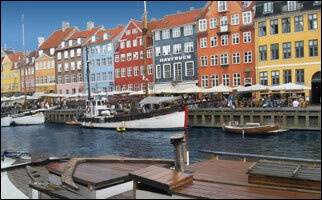 Most Canal tours leave from Nyhavn. Photographers will love Nyhavn. This long, narrow harbor is flanked on both sides by colorful old buildings. Outdoor cafes line the cobblestone sidewalks. And traditional sailing boats dock along side. Hans Christian Andersen's fairytale maiden sits on a rock gazing out to sea, longing for her prince charming to return. The Little Mermaid is the second most photographed statue in the world (after the Statue of Liberty). The Little Mermaid statue traveled to China in 2010 for display at the Shanghai World Expo. Five million Expo attendees saw her during her half-year visit. She returned later that year to Copenhagen.